An interesting book and a very attractive cover, it would make a nice addition to your collection if you need a book of Korean recipes. In the end, “A majestic view has no charm if the table is bare.” Harriett Morris quotes a “Korean proverb” at the beginning of the final chapter detailing dinner menus. “The Art of Korean Cooking” was written in 1959, when Korea suggested “far-flung battlefronts and cold wars rather than the unequivocal pleasures of the table”. This is a small book, spiral-bound, with an aesthetically pleasing patchwork front cover. A tiny insert on the front page gives the price in both dollars and yen: $3.05 or 700 yen. The introduction notes that seasonings have sometimes been reduced, “to suit the Western palate, which is not accustomed to the extremely high seasoning so often found in Oriental cuisine”. Sesame is almost universal in these recipes. A “prepared sesame seed”, involving browned and mashed sesame seeds, is called for in most of the recipes from soups to meats to desserts. Keem-chee gets its own chapter. Keem-chee, also translated as “kimchee” more commonly today, is very much like a spiced sauerkraut. Most of them even call for cabbage: you chop the vegetables, cover in water, and let sit for a few days. It ferments into a spicy, self-pickled snack or condiment, depending on your temperament. Except for the “celery cabbage” called for in the kimchee, most of the recipes call for familiar ingredients. They tend to get mixed in non-western ways, however, as in “Sesame Seed Soup” (Cho-kay tang), which calls for chicken, soy sauce, ginger, onions, sesame, cucumbers, eggs, mushrooms, and pears. The vegetable chapter is generally more prosaic, consisting of interesting, simple recipes using quite standard ingredients. You’ll find fried sweet potatoes, fried onions, fried potatoes, spinach & beef, and any number of recipes that would be at home on any rural American table. In the meat and fowl chapter, what distinguishes the recipes from Western recipes tends to be no more than the soy sauce and ‘prepared sesame seed’. “Liver Pok-Kum (Kan pok-kum)” is nothing more than liver and onions, but using soy sauce and sesame seed for additional flavor. “Beef Pok-Kum” adds candied ginger to the ingredient list. Coming far second to prepared sesame seed, candied ginger and pine nuts are also common ingredients in these recipes. Most of the seafood recipes are for fried seafood. The three exceptions are “Boiled Fish with Vegetables”, “Salted Fish”, and “Raw Oysters”. Desserts includes an interesting “spinach cookie” recipe: the “Cinnamon Folds” calls for wrapping “parsley, spinach, or celery leaves” into a dough while frying. It also calls for a cinnamon mixture of cinnamon, sugar, and prepared sesame seed. Dates are common, a couple of chestnut recipes, a wonderful strawberry beverage and ginger tea, fried honey cakes, and candied fruit fill this chapter with very sweet desserts. The sample recipe includes a guess: the recipe calls for 1 cup sugar, and the instructions call for adding 1 cup sugar to the strawberries, and then the remaining sugar with boiling water... For the most part, however, the recipes are better tested. I can’t recommend searching this book out, but if you see it at a good price and you don’t already have a Korean cookbook, I think you’ll find it useful and interesting. Wash berries, remove stems, slice, and add ½ cup sugar. Boil water and remaining sugar five minutes and cool. Place berries in small glass bowls, add the syrup and pine nuts, and serve with a spoon. If you enjoy Asian, you might also be interested in Classic Chinese Cuisine, Corn and clam soup, and The Complete Book of Oriental Cooking. If you enjoy cookbooks, you might also be interested in A Concise Encyclopedia of Gastronomy, Bull Cook Historical Recipes, Cavalier Cooking, Classic Chinese Cuisine, Cooking the Bahamian Way, Country Commune Cooking, Life, Loves, and Meat Loaf, The Casserole Cookbook, The Complete Book of Oriental Cooking, The Complete Bread Cookbook, The Frugal Gourmet Celebrates Christmas, The Healthy Cuisine of India, The New Larousse Gastronomique, Saucepans and the Single Girl, The Northwest Cartoon Cookery, Good Food From Mexico, Laurel’s Kitchen, The Cooking of Vienna’s Empire, James Beard’s Fireside Cook Book, French Bistro Cooking, A Fifteenth Century Cookry Boke, Crockery Cookery, Southern Cooking, The Frugal Gourmet Keeps the Feast, The Fannie Farmer Cookbook, French Cooking Simplified With a Food Processor, In Good Taste, Heritage of America Cookbook, Our Favorite Hometown Recipes Vol. II, The Indian Spice Kitchen, Japanese Country Cookbook, La Cuisine Française, Larousse Treasury of Country Cooking, The Natural Foods Cookbook, A Russian Jew Cooks in Peru, Soul Food Cook Book, The Tassajara Trilogy, Pains Spéciaux & Viennoiseries, Whole Earth Cookbook, The Wok: a chinese cook book, Southern Living Cookbook for Two, Lebanese Cuisine, The Art of Syrian Cookery, Popular Greek Recipes, In a Persian Kitchen, The Art of Pennsylvania Dutch Cooking, and The Southern Living Cookbook Library. 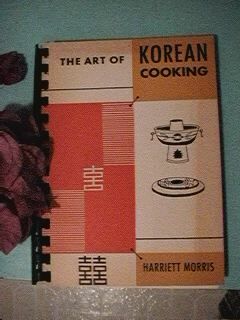 If you see it at a good price and you don’t already have a Korean cookbook, I think you’ll find this book by Harriett Morris useful and interesting. The Art of Korean Cooking last modified May 25th, 2009.